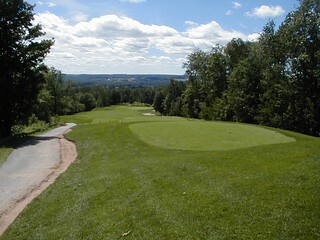 Fazio Premier- Hole #1 – View from the tee. If you have never had the pleasure of playing this game that gives us so much frustration (and pleasure) in the Gaylord area, well, you are in for a treat when you do. You will find it hard to believe that our great relatively flat state can have these kinds of hills and ravines that you will encounter in the Gaylord area. 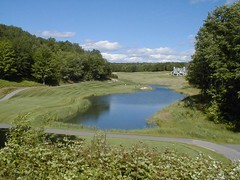 Smack dab in the middle of this sits Treetops, with four courses and an unbelievable par three. One of which is The Fazio. Located at Treetops North, the Fazio Premier easily could have been called Hidden Valley, or Wilderness Valley, but those names were already taken by other courses in the Mecca. The Fazio weaves back and forth from one tree lined valley to another with an occasional ridge top hole thrown in for good measure. Once in a while they found it necessary to cross over in the middle of a ridge so they put a tee on top and gave us a par three or a great shot to a valley floor falling away in front of you. 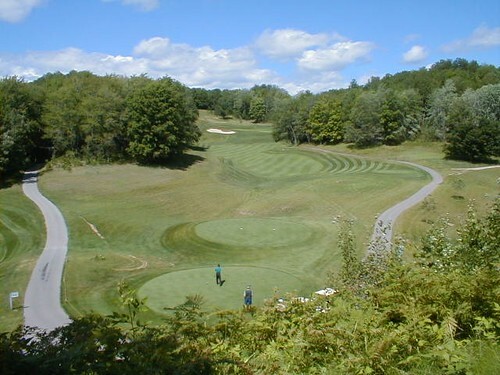 From these kinds of tees, you will understand why this complex is called Treetops. They don’t waste any time getting that message to you either. 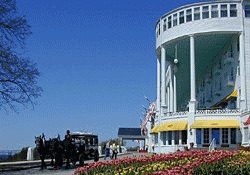 From the first tee you can see the tops of trees for miles. This may be one of the greatest starting holes in the country. At least in Michigan. I’m a farm boy, what do I know about great starting holes around the country. You stand on the first tee with miles of valley filled with trees before you. This will be the first time you dig the camera out of the bag, but it won’t be the last. The fairways on this course are wide. You get the feeling that you can’t miss them. Well that’s just a feeling. It can be done, and most likely will be, believe me. They are in great shape, and if it weren’t for the fairway bunkers they would be all you could ask for. Large hardwoods line each hole, and keep other holes out of sight, so you play each hole as if you have the course to yourself. 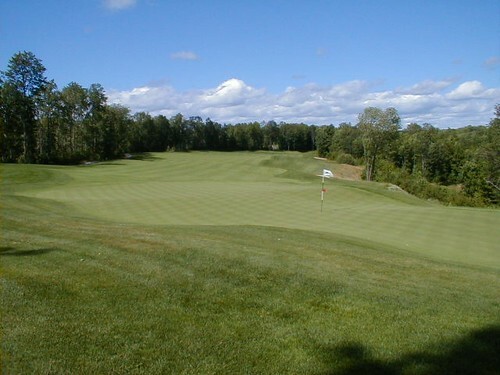 This course plays under six thousand yards from the white tees, to give you a beautiful and relaxing round of golf. Drop back to the black tee’s and add a thousand yards to the length, and all you have left is the beautiful part. You now have a lot of work in front of you. Plan on long irons and fairway woods to greens that are tough with any iron. The Fazio has a lot of elevated tees and greens that gives you some great views of the contrasting color between the darker green of the rough and the lighter green of the fairway. As you stand there and look at the fairway work its way around the bunkers and trees up to the green, you realize there is a lot more to like about this game than hitting a ball with a stick. On this course that’s a view you get many times. 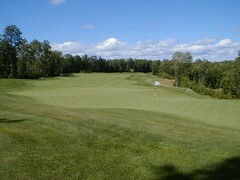 The greens are large and well designed. It seems that the more challenge there is getting to the green, the easier it is to putt. On the other hand, a hole that a good drive leaves you with a short chip shot to the pin, you can expect greens that challenge your putting skills. Watch out for tiers and slopes that leaves your ball in unexpected places. So if a good drive leaves you with a short shot to the green and the word “birdie” pops into your mind, beware, theirs trouble just ahead. Two of the par threes you’re hitting to a green below you, so drop and wind make club selection a challenge. The other two are on the long side, and one is over water. Unless you’re playing the black tees, you can at least think about getting home in two on the par fives. The challenges on these holes are putting and well bunkered greens that seem to want to collect golf balls. The bunkers around these greens are not all that easy to get out of either. You will find a real variety on the par fours. Elevated tees, elevated greens and quite often both on the same hole. Gentle doglegs, sloping fairways, bunkers, trees and more scenery that you brought film for. I told you that most of the holes run along a valley floor, so it tends to kick you ball back to the fairway. I like that. All this put together in a package that does Mr. Fazio and Treetops proud. Don’t miss this one, and don’t forget your camera.